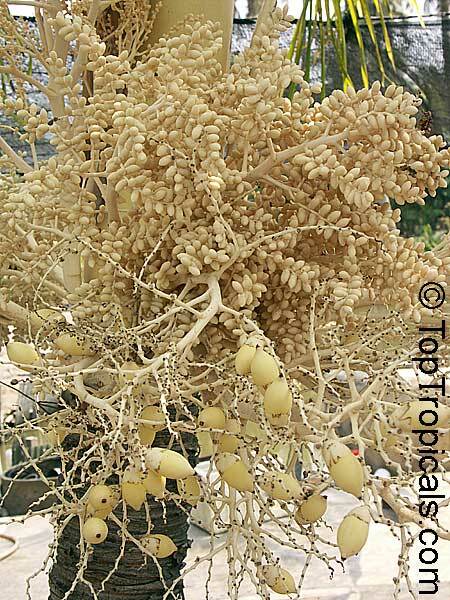 Origin: Indies, Bahamas, Central and South Florida. 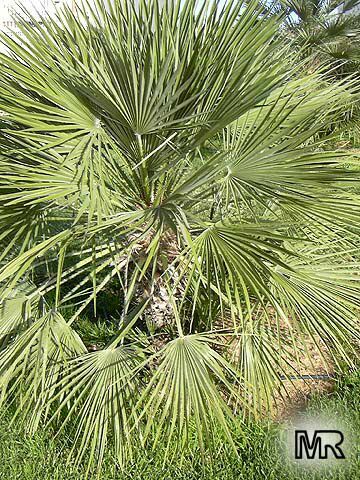 Paurotis is a native Florida palm found in the Everglades, commonly seen at the edges of islands, but not in long-standing water. It is also native to some Caribbean islands. 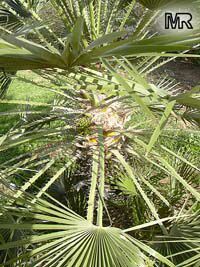 It likes full sun but can withstand light shade, is tolerant to a variety of soil conditions, but doen't like to be planted in high pH soils. 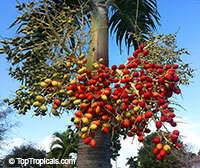 The palm grows in clusters of trunks and is rated to be about 20 feet high. 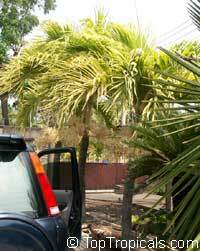 Its width can be a problem when planted without space for lateral expansion. 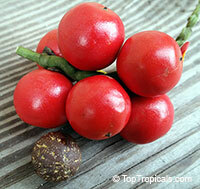 Adonidia comes from Adonis, the handsome sun god of the ancient Greeks. 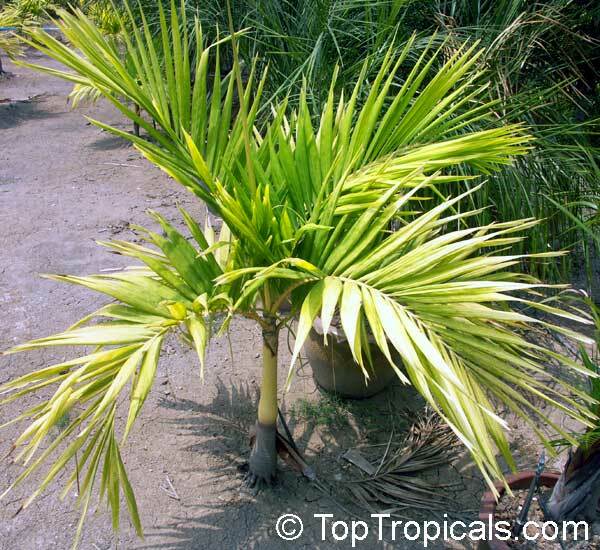 This is neat looking, compact palm that resembles a dwarf version of the royal palm (Roystonea regia) which it matches in beauty. 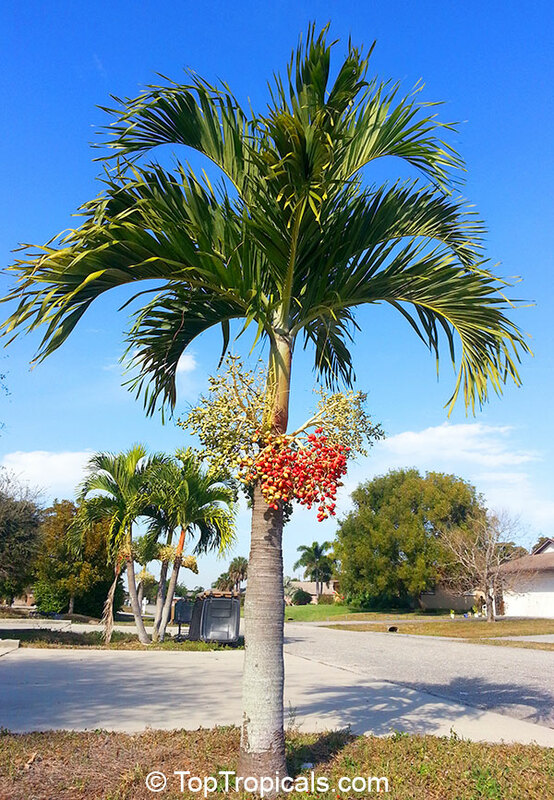 Christmas palm grows to an overall height of only about 16 ft. By late fall fruit are beginning to ripen and by late December are bright and brilliant red - like ornaments on a Christmas palm! 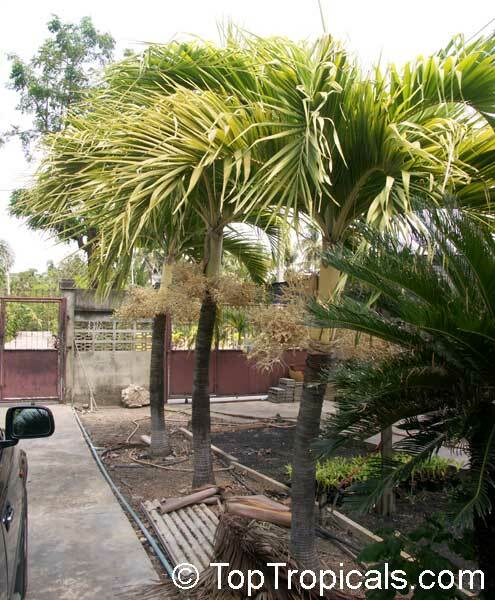 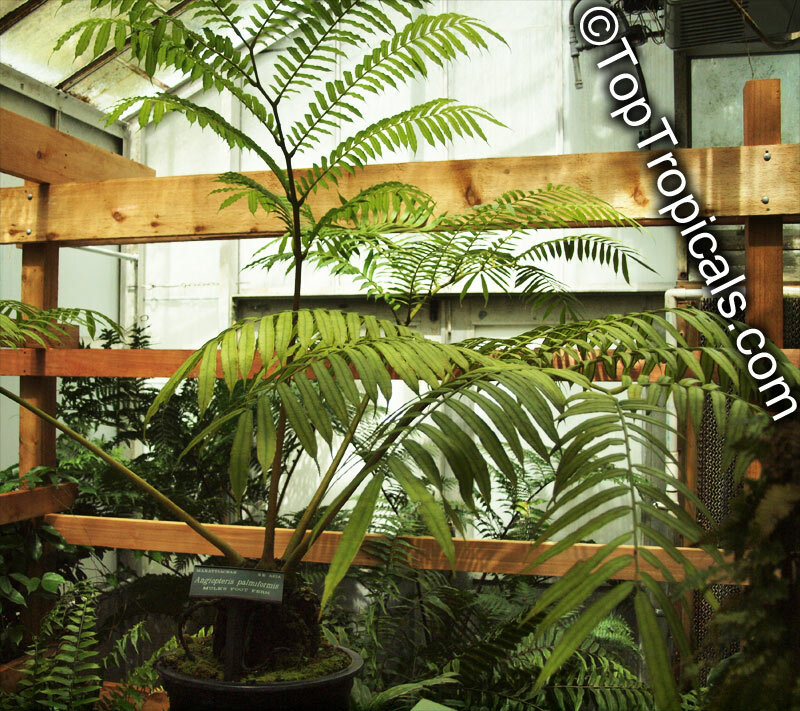 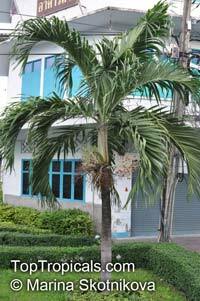 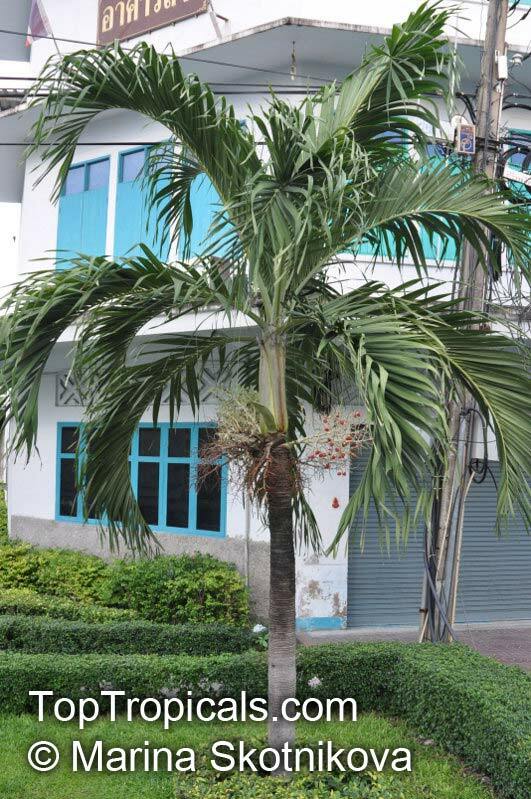 It is a popular landscaping item in the capital of Philippines, which inspires another popular name, the Manila palm. Christmas palm is moderately salt tolerant. Prefers full sun but will take some shade. 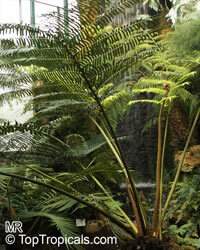 Small stature makes it perfect for use in small scale plantings. 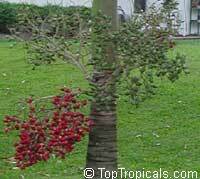 It is sometimes closely planted in groups of two or three. 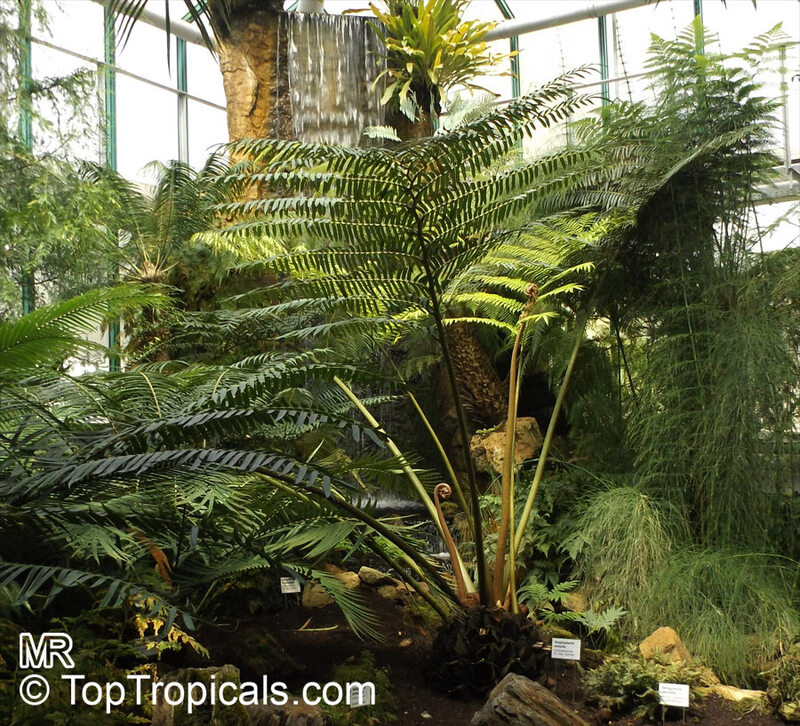 Good specimen container plant. The formal symmetry of Christmas palm is nicely showcased when it is grown in a container. Indoors or out this is a glamourous container plant that can maintain its looks despite hardship and neglect. 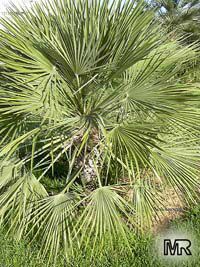 Adonidia comes from Adonis, the handsome sun god of the ancient Greeks. 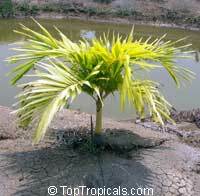 This is neat looking, compact palm that resembles a dwarf version of the royal palm (Roystonea regia) which it matches in beauty. 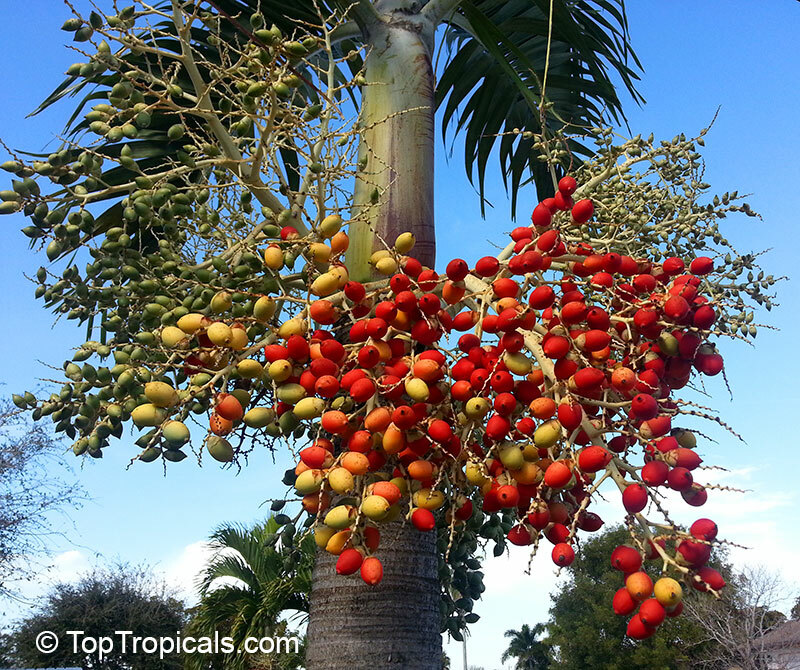 Christmas palm grows to an overall height of only about 16 ft. By late fall fruit are beginning to ripen and by late December are bright and brilliant red - like ornaments on a Christmas palm! Small stature makes it perfect for use in small scale plantings. 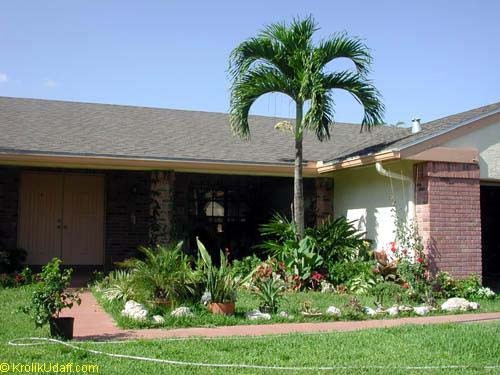 Good specimen container plant. 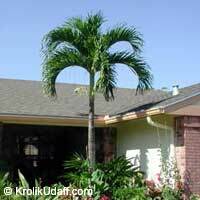 The formal symmetry of Christmas palm is nicely showcased when it is grown in a container. Indoors or out this is a glamourous container plant that can maintain its looks despite hardship and neglect. 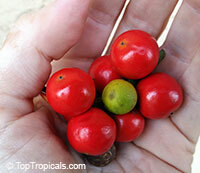 Fresh seeds germinate quickly within 1 to 3 months. 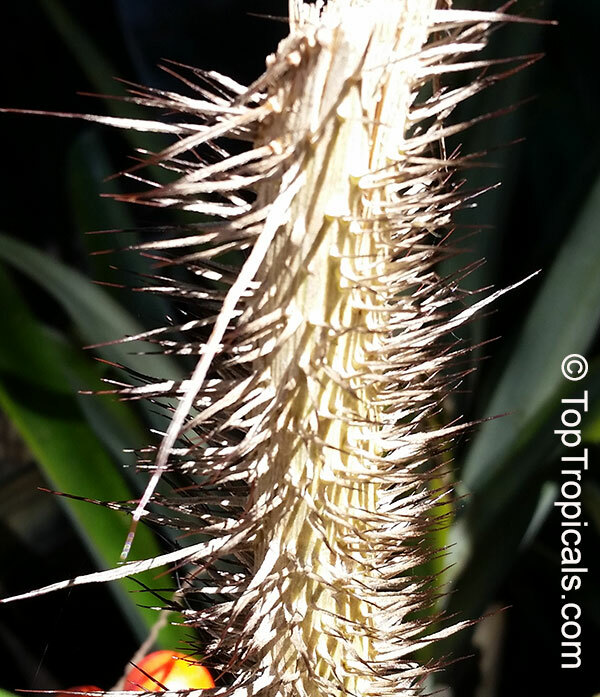 Soak seeds overnight, clean all pulp around the pit. Plant in well drained mix, keep it warm, moist but not soggy. A solitary, showy spiny small tree. 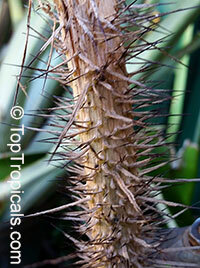 In the wild it grows 9–15 feet tall with a stem diameter of 2–4 inches. 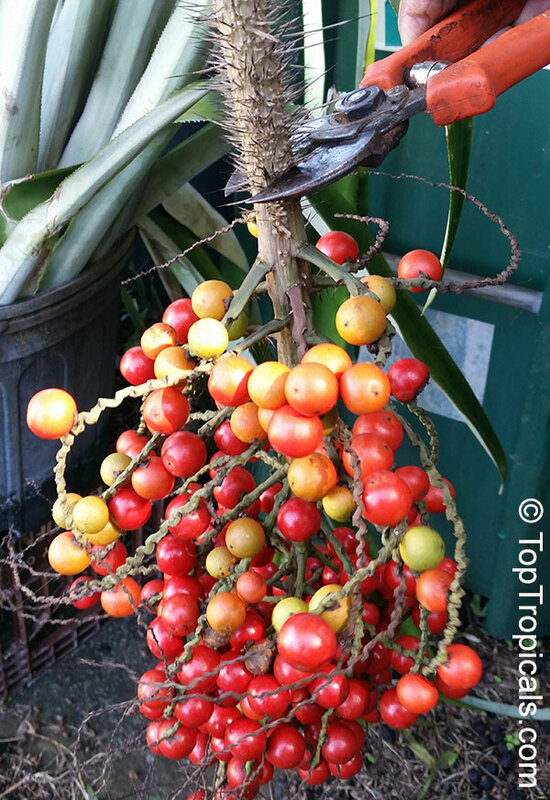 The epicarp and mesocarp of the fruit are rich in carotene and are eaten in Colombia, while the seeds are used to make candles. 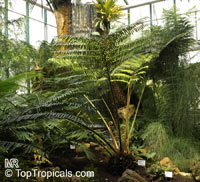 The range of the species is found in forests of Bolivia, Brazil, Colombia, Peru, Trinidad and Tobago and Venezuela. 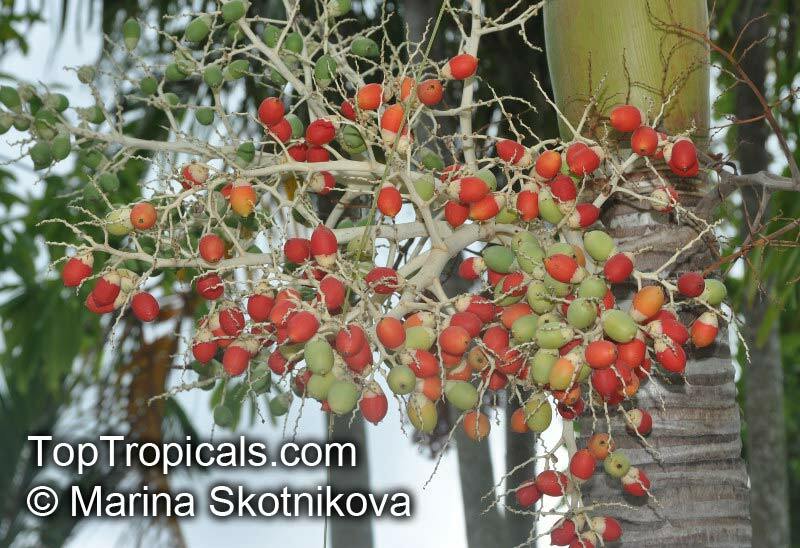 The species is cultivated as an ornamental throughout the tropics. 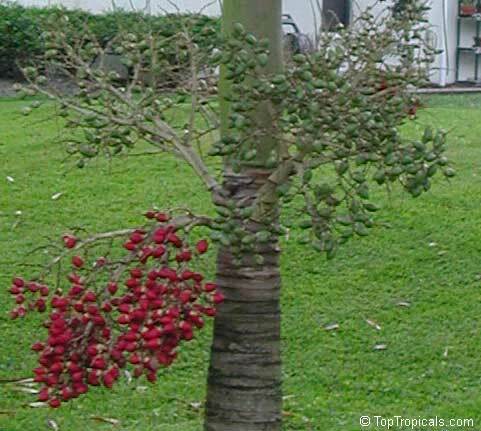 Also known as Devil Palm, Corozo, Cocos rura, Mararay, Corozo, Macaguita, Marara, Macahuite, Corozo del Orinoco, Corozo anchame, Mararava, Cubarro, Chonta, Chascaraza, Charascal, Corozo chiquito, Corozo colorado, Pujamo, Gualte, Chonta ruro, Pupunha xicaxica, Coyure palm, Ruffle palm, Aculeata palm and Spine palm. Scientific Synonyms - Caryota horrida, Aiphanes aculeata, Euterpe aculeata, Martinezia aculeata, Martinezia caryotifolia, Marara caryotifolia, Aiphanes caryotifolia, Tilmia caryotifolia, Bactris premorsa, Aiphanes premorsa, Martinezia truncata, Aiphanes truncata, Martinezia elegans, Aiphanes elegans, Marara bicuspidata, Martinezia ernestii, Aiphanes ernestii, Martinezia killipii, Aiphanes killipii, Aiphanes orinocensis. 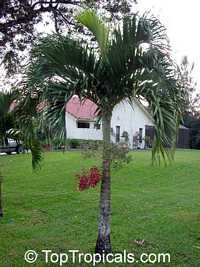 Seashore palm - restinga, a low, coastal scrub, and sand dunes near the beach are the native habitat of this attractive, small, bushy palm in southeastern Brazil. Its forking trunk usually grows underground, rarely upright and visible. 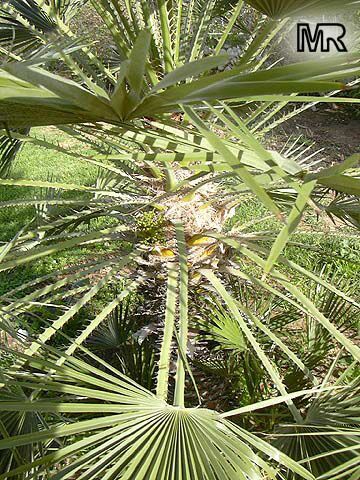 The elegantly arching, bushy leaves are dark gray-green above and silvery-waxy below and the fruits are borne in curious, dense clusters on the tip of long, upright stalks. 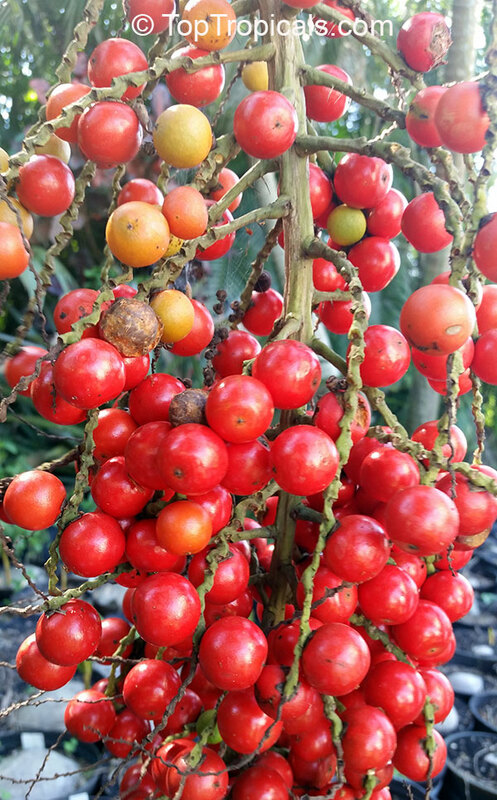 While the seeds tend to be somewhat erratic to germinate and seedling growth is fairly slow, the plants speed up considerably after a couple of years. 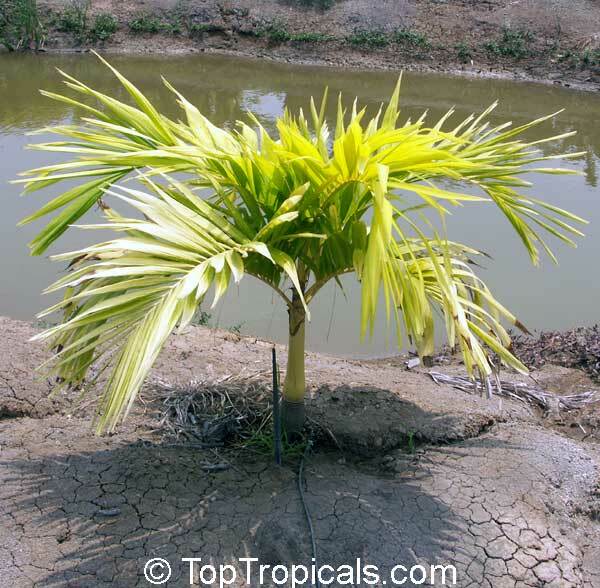 The Restinga Palm prefers a sunny spot in sandy soil and will adapt to any tropical and subtropical climate. 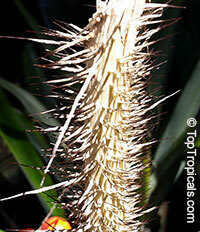 It is very resistant wind and salt and will look its best even under full coastal exposure. 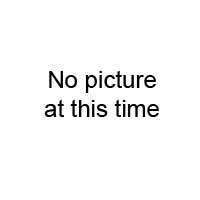 See picture.